The amigurumi boy now has pants! 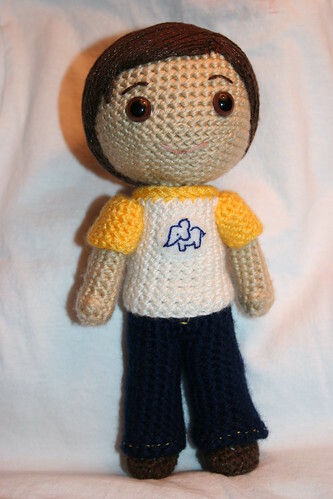 Boy amigurumi now in pants, originally uploaded by *mia*. I just wanted to show the little guy now that he’s wearing pants, I think I like him better this way. We’re at my parents house sitting for the weekend, so the picture wasn’t taken in the greatest lighting, but I wanted to stick it up here anyway. I’ve been working on two other amigurumi’s right now, a pattern that I bought on etsy, and another one of my own design, hopefully I can get at least one finished this weekend, but the hubster is helping someone from work move tomorrow so I’m all day alone with the kidlets, which doesn’t leave much time for crochet. You did a great job! I look forward to more FOs!! oh gosh, I think he looks way better with long pants! !